Sorry for the really, really late blog post, but this is the last one I’ll do, so I wanted to make it comprehensive and conclusive. If you haven’t read about my personal challenge to get 75 coffee dates with new people in three months, you can read it here. The deadline was the Wednesday of finals week. 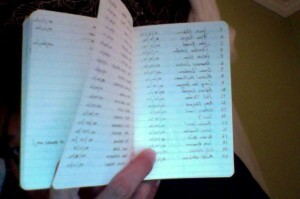 I finished with 63 official coffee dates. But I didn’t finish with 63 because only 63 people wanted to have coffee with me. Rather, I finished with 63 because I didn’t have enough time. If I had more non-academic time to dispose of, I would have easily been able to meet my goal. You see, I kept two important lists in my little moleskine: People who agreed to have coffee with me, and people who I’ve had coffee with. In the past three months, I never missed the opportunity to rekindle dying friendships and meet brand new people, and my “to-do” list grew to 94 contacts. This means that 31 people on my “to-do” list had agreed to have coffee with me, but could not because either our timing or schedules just didn’t work out. Obviously it wasn’t to make as many new long-lasting friends as possible. I was about to graduate and move to San Diego for graduate school, and I knew that I would probably never see half these people again. However, I do plan on staying in touch with some of the people I’ve met, either via Facebook, coming back to visit as a proud Puget Sound alum, or other. One of my coffee contacts, for example, is one of the main actors in a short film, and I plan to go up to see it at the Seattle International Film Festival. But again, I never intentionally planned on making 75 new BFFs in three months. No. There was a reason why I challenged myself to do this coffee date project. As you might have gathered from my past blog posts, I am genuinely interested in meeting new and different people. They teach me something new and show me a different perspective to everything. Before I came to Puget Sound (and even before I had even started applying to colleges) I had already envisioned my ideal college experience. It included meeting new people, learning from their experiences, having challenging discussions, and growing and maturing in a way that only a college campus can foster. I’m sure I’m not alone in expecting this, there must be others who expect the same thing out of college. But how often does this expectation become a reality? The real reason why I did this coffee challenge was to show to the rest of my community that Puget Sound is safe environment to meet new people, even after cliques have been formed (see disclaimer at bottom). You’re not stuck with the friends you already have. It’s never too late to meet new people and make new friends. Even a radical and straightforward method–such as directly asking strangers for a coffee date–will work. I embarked on this coffee challenge and blogged about it so that the unknown can now be known: Someone at Puget Sound has challenged himself to meet a ton of new people and he hasn’t been stoned to death. What a wild ride it’s been. After three months of meeting new people and steadily stepping further and further outside of my comfort zone, I can say that my experience has been both enlightening and exhausting. I’m feeling a sense of belonging to the overall Puget Sound community that I haven’t felt for a long time. This is the sense of small, close-knit community that Puget Sound boasts, and I’m feeling it now. I’ve learned more outside the classroom than I’ve have inside it, and the majority of what I learned outside the classroom is what I’ve learned from other people and their experiences. I’ve had several coffee dates that I wished didn’t have to end. From one coffee date, I learned about religion and spirituality, and about his experience living at a Buddhist monastery before coming to college (this guy seriously seemed like an endless well of wisdom). From another, I learned about the challenges of leadership, and about his experience with doing what is right versus doing what is popular. One of my more recent coffee dates told me about her experience living in Tanzania, about her experience living in a culture where she has never felt such sense cooperation and collectivity, and about her transition coming back to a highly individualized culture. The Black Student Union recently established a new publication on campus called “Black Ice” (which you can download here), and its tagline is “Studying abroad on my own campus.” I found that this tagline resonated with my coffee date challenge. I, regretfully, never took the opportunity to study abroad, so I never immersed myself in something unfamiliar. But nonetheless I found that I could still immerse myself in the many microcosms of perspectives on my own campus. So, I’ve taken on the personal challenge of meeting 75 new people in three months, and now I charge you with a similar one. Whether you are an incoming freshman or an incoming senior, I challenge you to meet 10 brand new people this semester and every semester to come. You can learn a lot from someone in 12 oz. of brewed goodness. Disclaimer pertaining to all four of my blog posts: I do not intend to pin the “social awkwardness” as a distinct characteristic of Puget Sound. Rather, it is a generalization that I am making of society in general. Additionally, I do not intend to ever imply that Puget Sound is overly cliquey; forming cliques is socially natural and is a human tendency we all succumb to. This entry was posted in Westley Dang '12 and tagged coffee, coffee dates, friends, life, making friends, people, Student Life. Bookmark the permalink.